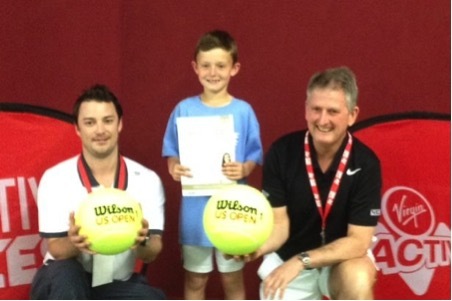 Harry Bell has taken a massive step on the way to potential tennis stardom after winning a three-year sponsorship deal – and he’s only seven. The St Peter’s Catholic Primary School pupil won the Virgin Active Search for a Star 2015 tennis competition which had more than 1,000 entries. His reward was a sponsorship deal with Wilson for £3,500 worth of coaching and total prize package overall woth between £9,000 and £10,000. Dad Garth Bell said: “Harry started up playing tennis two years ago at Desford tennis club – we just took him along to try it – where his coaches were Alec Matty and Harry Matty. Harry, whose favourite players are Britain’s Andy Murray and world number one Novak Djokovic, was given a passport by the Lawn Tennis Association to play orange ball which usually children can only take part in when they reach the age of eight – one of only two or three a year handed out by the LTA. To win the Virgin Active competition he won a regional two-day event in Warwick and was one of 16 boys asked back before one was chosen to go on to the national finals in Chiswick. At this point 22 boys and girls were put through their paces and judged by Simon Jones, head of the LTA and David Felgate, former coach of Tim Henman, who looked at footwork, agility, technique and other skills. One boy and girl were then selected to receive the sponsorship deal with Harry coming out on top.